Property and Finance FAQ | Farias Family Law, P.C. If your spouse is hiding money, it’s best to address the issue as soon as possible. The moment you suspect this is happening, you should plan to consult a divorce attorney for advice on how to proceed. The longer you wait and the more money that’s siphoned out of the marriage, the more difficult it will be to trace and recover. The attorney will likely file for divorce quickly and possibly ask for a court order to address the conduct. The attorney then may conduct “discovery” to obtain information about where the money’s going and how much is missing. Cases involving hidden cash are particularly challenging because of the lack of verifying documents and overall corroborative evidence. The answer is: it depends (damn lawyers never give a straight answer!). 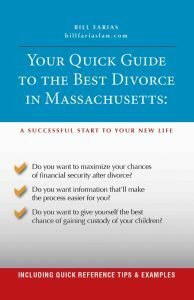 Under Alimony Reform, which went into effect in MA on 3/1/2012, if the spouse receiving alimony is “cohabitating” with another individual for at least 3 consecutive months, the payor may file to reduce, suspend or terminate alimony. However, in MA, this recent change in the law technically only applies to cases that were finalized after the passage of the new law on 3/1/12. So if your case was resolved before then, you can’t rely on the “cohabitation” provision of Alimony Reform to reduce your alimony. Nonetheless, even if your case was disposed of before passage of the new law, it may still be worth consulting with an attorney to determine whether you can proceed with a modification of your alimony order on the theory that the person your ex is living with has decreased the recipient’s financial “need,” and therefore your alimony should be reduced anyway. Penalty for hiding assets in divorce? Hiding assets can result in significant repercussions in divorce. First, and perhaps most importantly, it likely kills the guilty party’s credibility with the court. If there are any issues that are brought before the judge on which credibility is an issue, that person is at a severe disadvantage. Also, regardless of any other issues, the judge has the authority to order a disproportionate division of assets, and has some discretion on alimony and child support payments. The party hiding assets may suffer consequences in those areas. Finally, the judge may penalize the guilty party by ordering that party to pay some of the other party’s attorney’s fees. Not worth it. Hidden assets in divorce are they discoverable? Yes. However, depending on the nature of the hidden assets and how long ago they were hidden, it may be difficult. In a divorce, the parties may conduct “discovery” to gain information from the other side. This includes asking them questions under oath either in written form or by questioning them at a deposition. In addition, either by subpoena or by requests directly to the other party, the parties may also request from each other documents that may provide evidence of hidden assets. However, if a party is hiding cash, or using money orders or bank checks, the information is much more difficult to discover. Am I responsible for my domestic partner’s medical bills? Maybe. All debt accumulated during the marriage may be included as joint debt for purposes of division of assets and debts in divorce. Whether the judge actually transfers responsibility for medical debt to the other party depends on a number of factors, including how the property and the rest of the debts are divided, the alimony order, among other factors. If a car is registered in my name is it legally mine after divorce? Yes. However, whether you’re actually keeping the car depends on the terms of the divorce, which allocates the property between the parties. Parties typically keep the cars in their respective names after divorce. But if the court judgement orders that the other party gets your car, then you must transfer it.